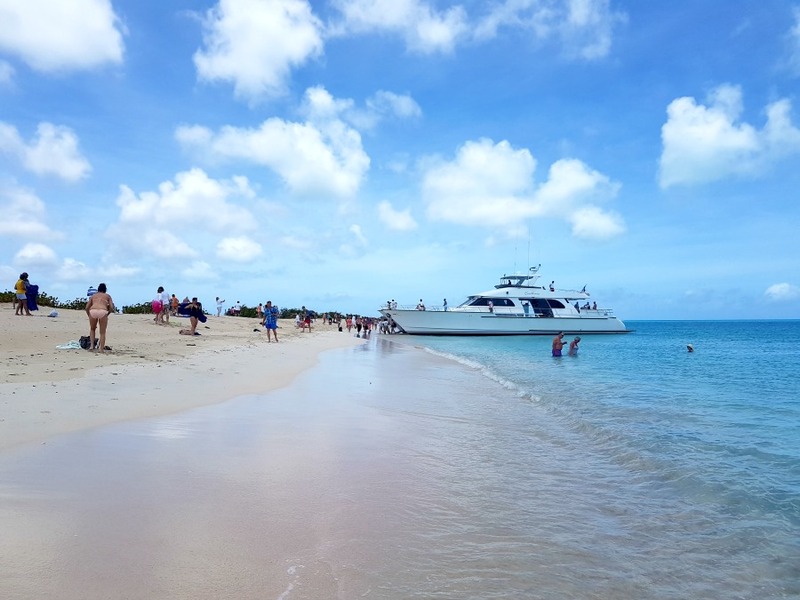 One of the day trips we definitely wanted to do while we were in Antigua was the boat trip to Barbuda. 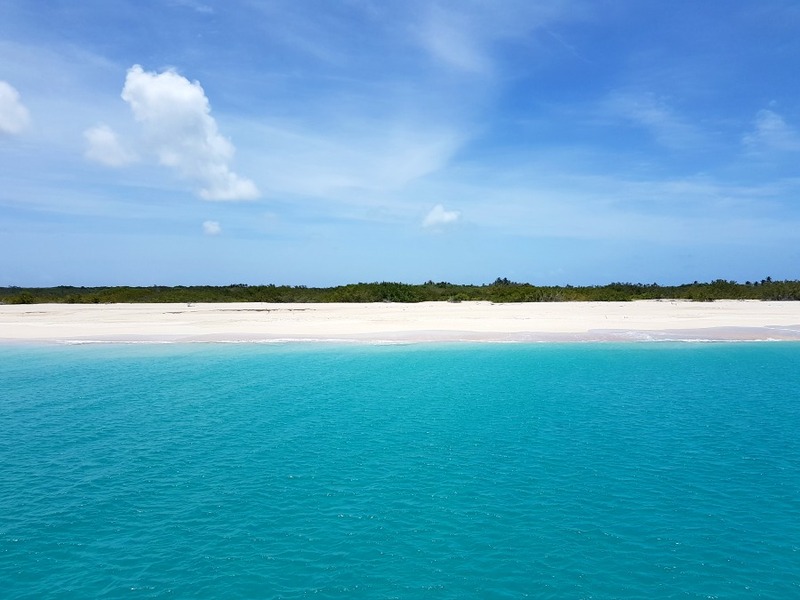 Barbuda is a small island that forms part of the state of Antigua and Barbuda, and is famous for the 17 mile white sandy beach, the Frigate bird sanctuary, and the pink beach! 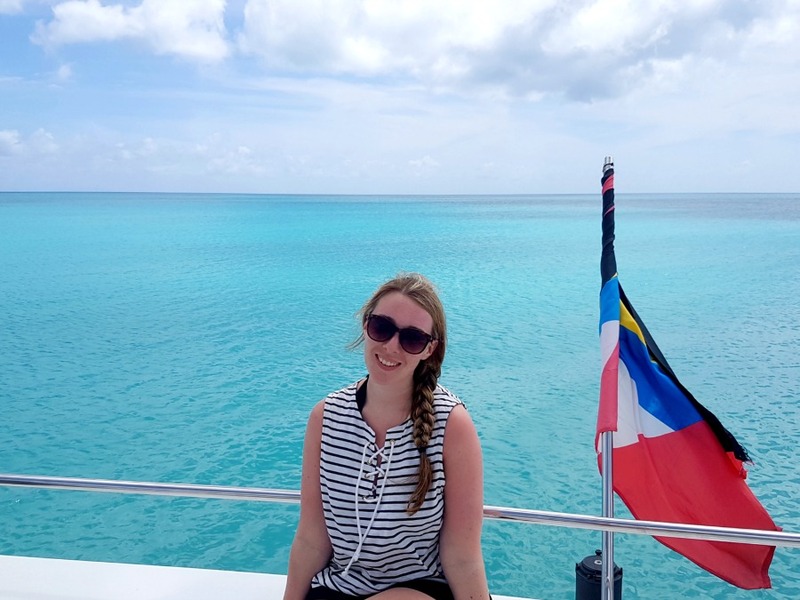 We booked onto the Excellence catamaran cruise, and were a little surprised by the whole experience, as it really wasn't what we were expecting. The catamaran was huge, with a lot of people on board. And I mean, not all of these people are British, so not all of them know the important of STICKING TO YOUR OWN SEAT. Some American people stole mine and Claire's seats after we went to get drinks, and we literally had no clue what to do...like do we ask them to move? Do we sit somewhere else? I burn so quickly and was already sunburnt so had specifically chosen those seats in the shade to keep out of the sun...and now I had to sit in the sun! Ugh. Rude. Anyway, as we sailed up (or drove? The catamaran was motor-powered) the coast of Antigua to pick even more people up from the Sandals resort, the views from the top deck were pretty incredible. We then had a good 90 minutes of sailing on the open ocean to get to Barbuda. 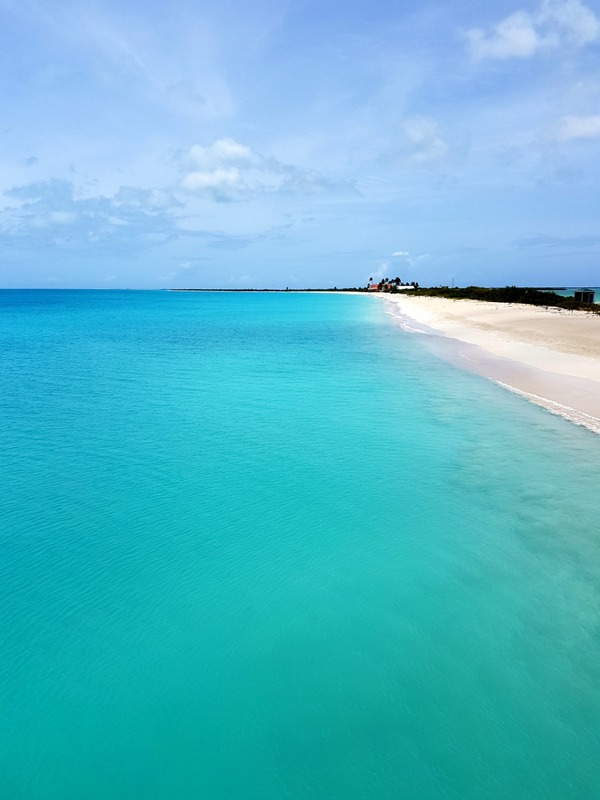 When we got there our mouths dropped at the stunning views over Barbuda's famous beaches. We all got off the boat and went onto the beach. Claire and I were a little disappointed that there were so many people on the trip, as it kinda ruined the tranquility of it all and the beauty of the beach. It felt overly touristy and just a bit of a let down. However, we tried not to let it ruin our experience and still loved swimming in the crystal clear waters and lazing around on the beach. After a while a fog horn sounded which signaled that lunch was ready, so we headed back onto the boat. The food was actually pretty good, with fresh barbecued fish and meat, and a delicious selection of salads. 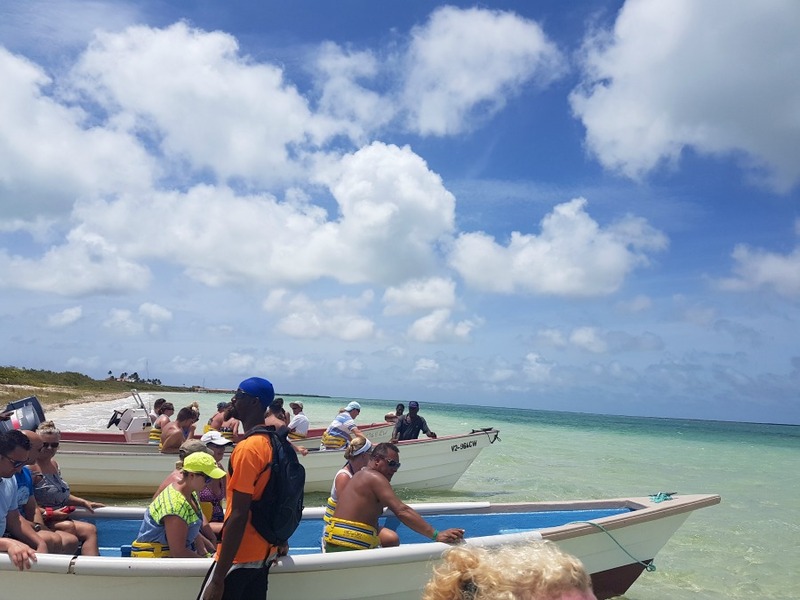 After lunch we went back onto the beach and walked over to the other side to get in a boat to visit the Frigate Bird Sanctuary. We had to wear those darn safety vests that we had to wear on our Antigua sailing trip, and we all crowded into boats before speeding off across the water. 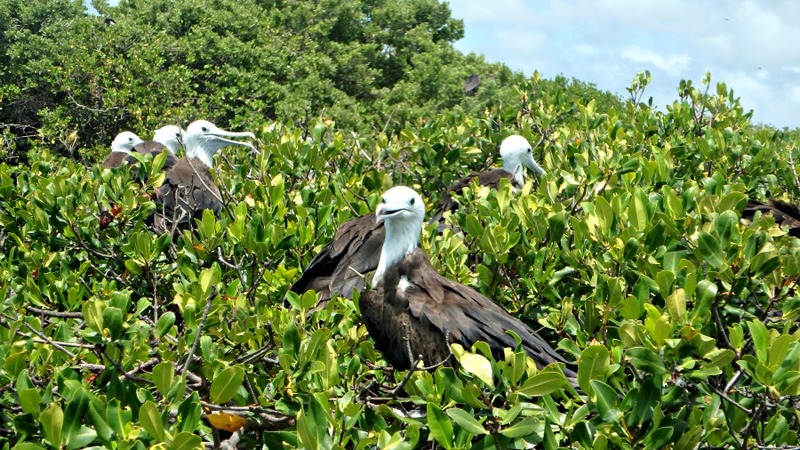 The Frigate Bird Sanctuary was OK...if a little boring. We're not really bird people, and it wasn't mating season so the male birds didn't have those beautiful famous big red necks they have during mating season. 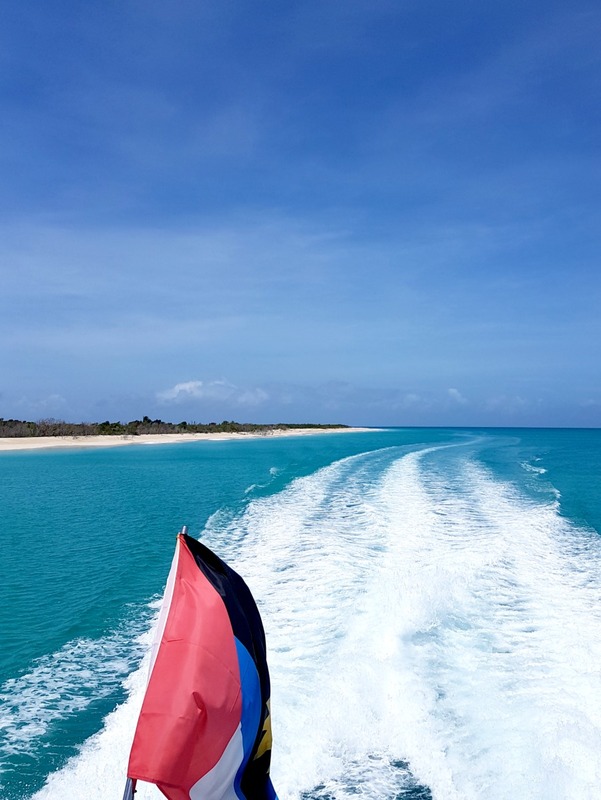 We finally headed back to the boat, and then the staff said we were heading back to Antigua. Um what? 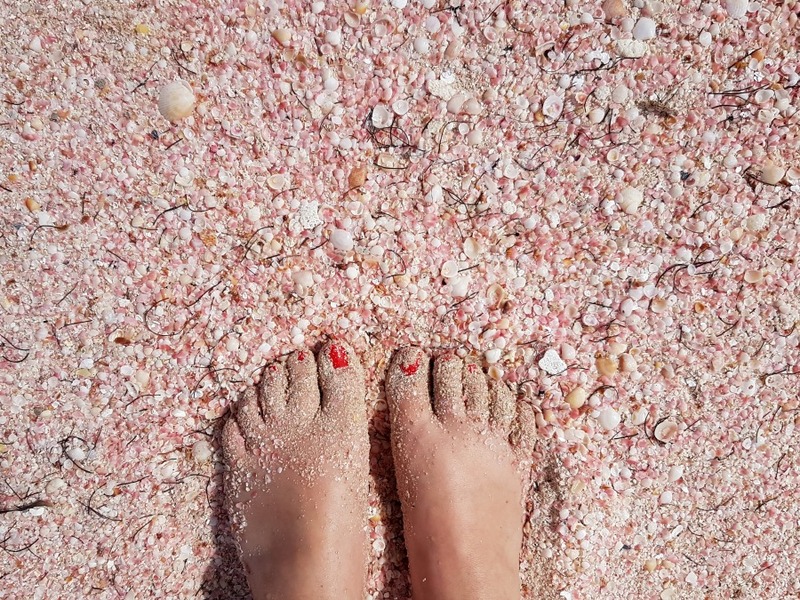 What about the pink beach? 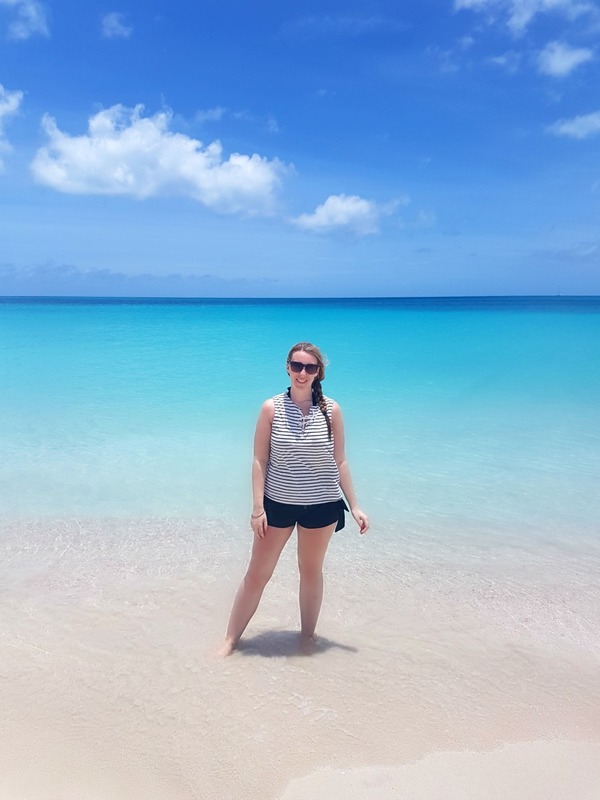 A lot of people complained because that was one of the main reasons for visiting the island, so eventually we all persuaded them to take us to the pink beach quickly. After all that it wasn't as impressive as pictures make it out to be. It was just a small line of pink shells, and looked nothing like the photos. Maybe we didn't go to the right beach, or maybe it was an off day, but I was quite disappointed. After another 90minute boat ride back to Antigua, Claire and I discussed the day and had a chat about it over cocktails. Considering the trip was $150 each, we felt it was very overpriced for what it was and at that price would have expected a much smaller group. We spent more time on the boat in the middle of the ocean than we did on Barbuda, and there is no opportunity for snorkelling whatsoever. 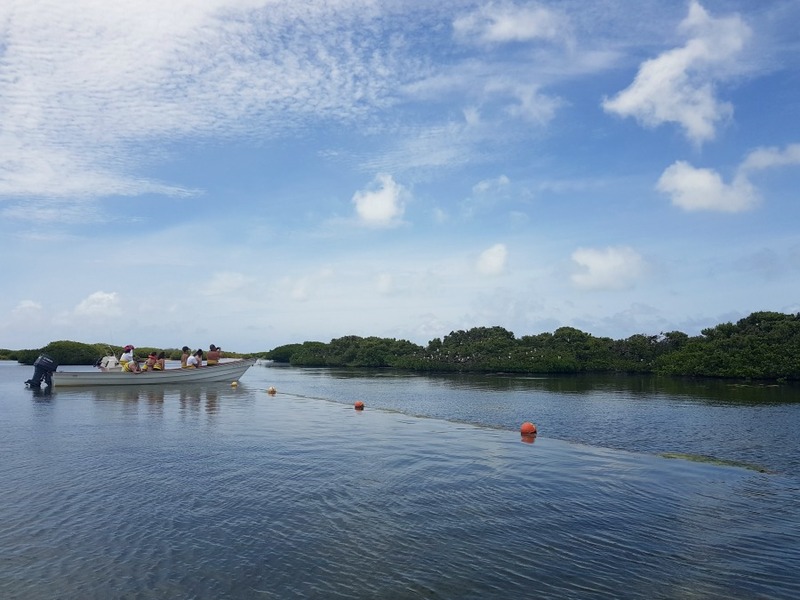 The entire Excellence trip was basically a glorified ferry service, and other people on the trip said exactly the same as us when we spoke to them. Honestly I wouldn't recommend it to anyone. I feel awful writing a bad review of something because I try to keep this blog positive and full of good things, but I also need to be honest and would hate for someone to spend $150 and be horribly disappointed! 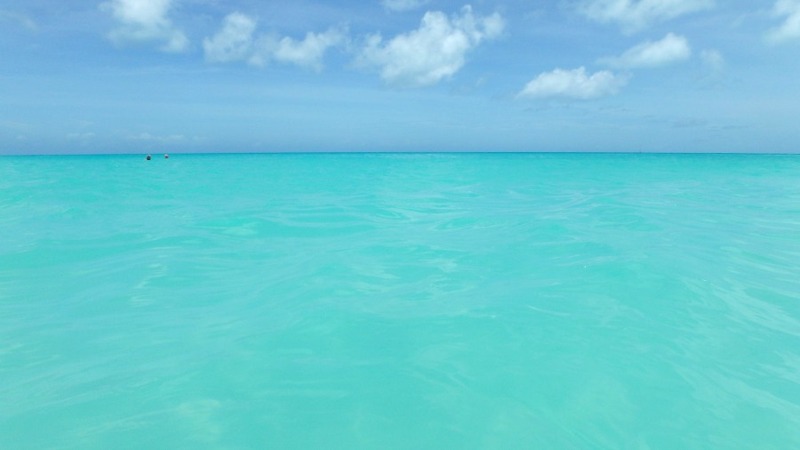 However, I do think Barbuda is worth visiting as the beaches are SO beautiful. But there are probably cheaper ways of visiting in a large group or ways of visiting that are the same price point but a smaller group of people. 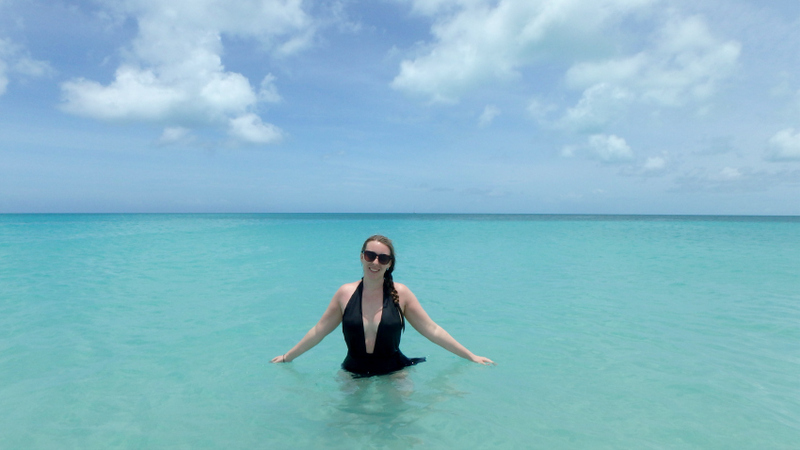 We much preferred our Antigua sailing trip with our hotel, St James's Club, and that one only cost around $55 each. 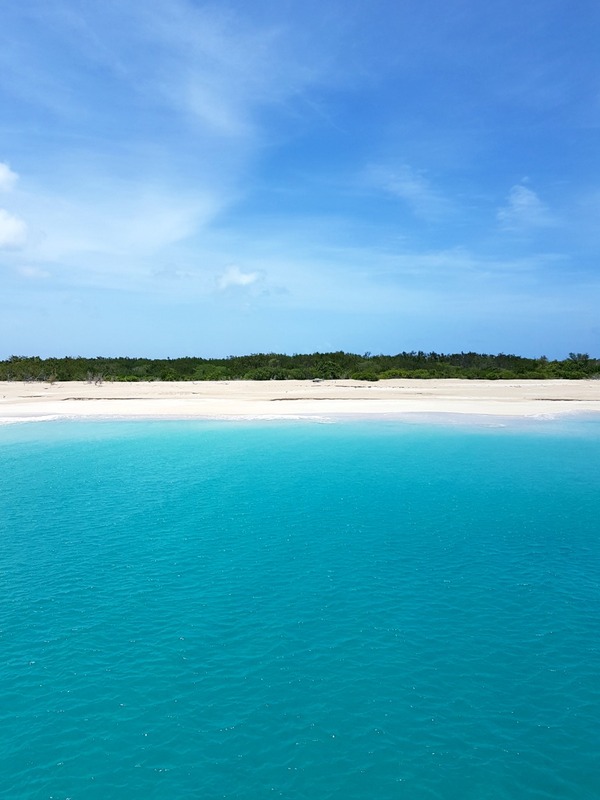 Have you ever visited Barbuda? 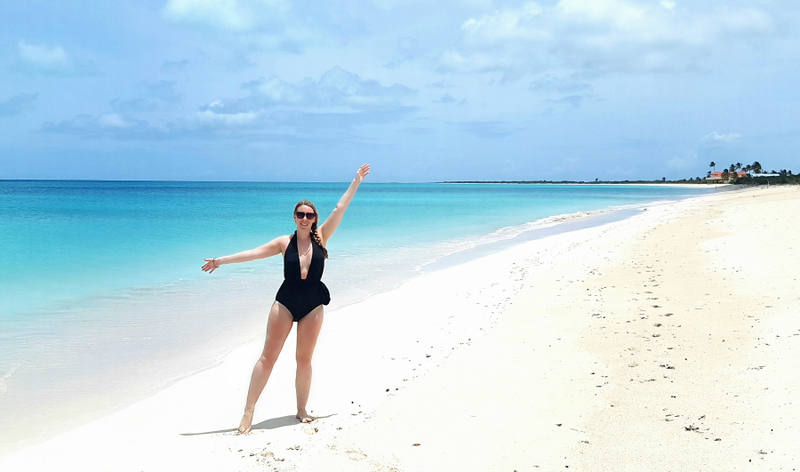 My trip to Antigua was in partnership with Elite Island Resorts and Hayes and Jarvis, with my accommodation and flights complimentary. This does not effect my opinion in any way and as always I am 100% honest in my reviews. 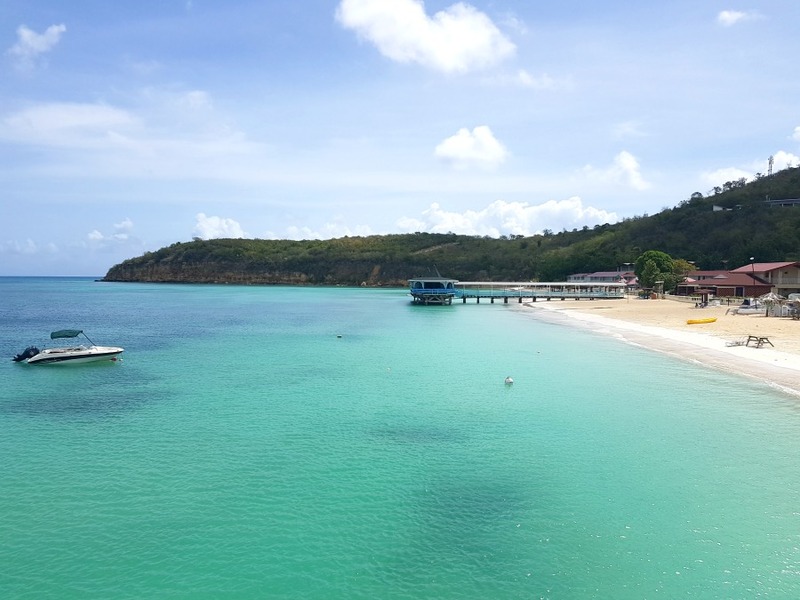 You can book a holiday to Galley Bay in Antigua via Hayes and Jarvis. That's a real shame and I hate a wasted day and disappointment on holiday! I does look beautiful but the hoards of tourists would have put me off too. I felt the same about writing the Geisha review I didn't want to be negative but it was so expensive that I felt like I wanted to warn people to manage their expectations about it. 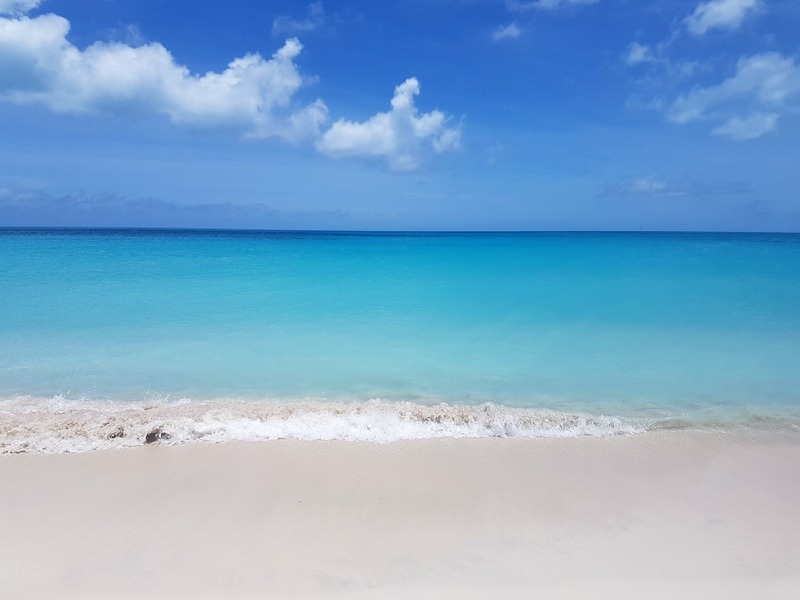 To enjoy all Barbuda has to offer you need to stay overnight for at least one night.It's not cheap to stay, travel around or eat out but definitely worth it. 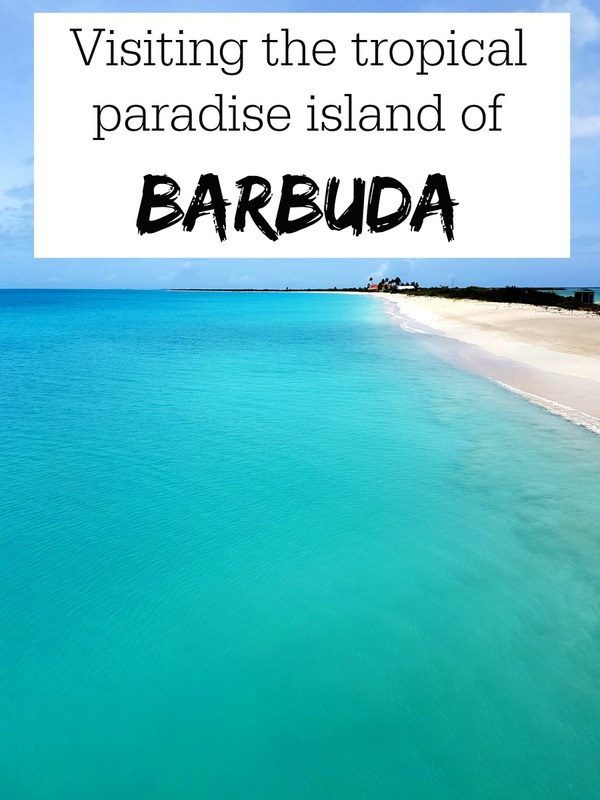 Reading this as I watch footage of IRMA...you are the only Barbuda blog I found! Thanks for the gorgeous pictures. Poor people, poor island.